1. Who develops breast cancer? 2. What is the Breast Cancer Risk Assessment Tool? 3. What are the risk factors used to estimate breast cancer risk in the Breast Cancer Risk Assessment Tool? 4. Why are some other risk factors left out of the Tool? 5. Is the Breast Cancer Risk Assessment Tool useful for all women? 6. What are some of the latest research findings on breast cancer risk? 7. Are there ways to decrease the chance of developing breast cancer? 8. How did BCPT and STAR use the Breast Cancer Risk Assessment Tool to add to our knowledge of breast cancer risk? 9. What else can a woman do about breast cancer? Breast cancer is the most frequently diagnosed non-skin cancer in American women. An estimated 213,000 American women will be diagnosed with breast cancer in 2006. The risk of breast cancer increases as women get older. Over the years, researchers have identified certain characteristics, usually called risk factors, which influence a woman's chance of getting the disease. Still, many women who develop breast cancer have no known risk factors other than growing older, and many women with known risk factors do not develop breast cancer. The Breast Cancer Risk Assessment Tool is a computer program that was developed by scientists at the National Cancer Institute and the National Surgical Adjuvant Breast and Bowel Project (NSABP) to assist health care providers in discussing breast cancer risk with their female patients. The tool allows a health professional to project a woman's individual estimate of breast cancer risk over a 5-year period of time and over her lifetime and compares the woman's risk calculation with the average risk for a woman of the same age. The Breast Cancer Risk Assessment Tool can be found at: http://www.cancer.gov/bcrisktool. 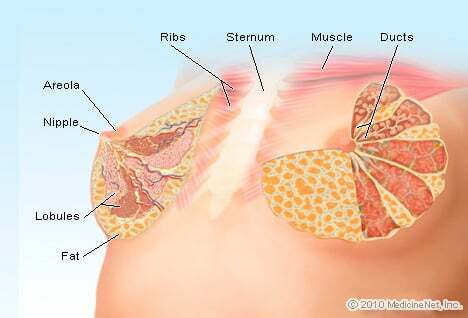 Personal history of breast abnormalities. Two breast tissue abnormalities -- ductal carcinoma in situ (DCIS) and lobular carcinoma in situ (LCIS) -- are associated with increased risk for developing invasive breast cancer. Age. The risk of developing breast cancer increases with age. The majority of breast cancer cases occur in women older than age 50. Age at menarche (first menstrual period). Women who had their first menstrual period before age 12 have a slightly increased risk of breast cancer. Age at first live birth. Risk depends on age at first live birth and family history of breast cancer, as shown in the following table of relative risks. For women with 0 or 1 affected relative, risks increase with age at first live birth. For women with 2 or more first degree relatives, risks decrease with age at first live birth. Breast cancer among first-degree relatives (sisters, mother, daughters). Having one or more first-degree blood relatives who have been diagnosed with breast cancer increases a woman's chances of developing the disease. Breast biopsies. Women who have had breast biopsies have an increased risk of breast cancer, especially if the biopsy showed a change in breast tissue, known as atypical hyperplasia. These women are at increased risk because of whatever prompted the biopsies, not because of the biopsies themselves. Race. White women have greater risk of developing breast cancer than Black women (although Black women diagnosed with breast cancer are more likely to die of the disease). Other risk factors for breast cancer have been identified or proposed but are not included in the Breast Cancer Risk Assessment Tool for several reasons: because evidence that these factors contribute to breast cancer risk is not conclusive, because researchers cannot determine whether these factors add useful information to factors already in the model, or because data on other risk factors was not available in the research data used to develop the model. Such risk factors include: age at menopause, use of birth control pills, high body mass index, a high-fat diet, alcohol, radiation exposure, and environmental pollutants. Recently published research indicates that breast tissue density, measured from mammograms, can add useful information, but risk models with breast tissue density measurement still need to be validated with additional independent studies. Research also indicates that other risk factors, such as use of hormone therapy, might improve the tool. The Breast Cancer Risk Assessment Tool was developed for women in the United States population age 35 years or older. It should not be used for women with a previous diagnosis of breast cancer, women exposed to breast radiation for treatment of Hodgkin lymphoma, or women who reside in, or recently migrated from, regions with low breast cancer risk, such as rural China or Japan. More accurate methods to project risk may be available for women with certain rare identified mutations, such as alterations in the breast cancer susceptibility genes BRCA1 and BRCA2. The Breast Cancer Risk Assessment Tool was developed and has been validated in populations consisting mainly of non-Hispanic white women. More research is needed to validate or refine the model for other racial and ethnic groups. Two studies in the September 6, 2006, issue of the Journal of the National Cancer Institute identified breast density as an important risk factor. * In one, a study of 11,638 women diagnosed with breast cancer, researchers identified different sets of risk factors in pre- and post-menopausal women. For pre-menopausal women, the risk factors included age, breast density, family history of breast cancer, and prior cancer diagnosis. For post-menopausal women, the risk factors included ethnicity, body mass index, age at natural menopause, use of hormone therapy, and a prior false-positive mammogram, in addition to all the risk factors for pre-menopausal women. The two separate models in this study for predicting breast cancer in pre- and post-menopausal women may be particularly helpful in identifying women at high risk for breast cancer. The other study adds breast density and weight to the Gail model, a model that is the basis for the Breast Cancer Risk Assessment Tool (see Question 2). As before, the new model can be used to project risk over 5, 10, 20 and 30 year intervals. The new model predicted higher risks than the previous model in women with high breast density, and previous analyses indicated that the new model had modestly higher accuracy. Independent validation studies are needed before this model should be used for counseling, and before making a permanent change to the Breast Cancer Risk Assessment Tool. Both breast cancer prevention studies, BCPT and STAR, explored ways of reducing the risk of developing breast cancer; their findings have increased our knowledge of risk. Both trials involved women who have not had breast cancer, but were at high risk of developing it. BCPT used the Breast Cancer Risk Assessment Tool to determine eligible participants by projecting each woman's individualized estimate of breast cancer risk. The projections were accurate; thus the BCPT results validated the Breast Cancer Risk Assessment Tool. STAR researchers used the Breast Cancer Risk Assessment Tool for determining eligibility for enrollment. All STAR participants had to have an increased risk of breast cancer equivalent to or greater than that of an average 60- to 64-year-old woman. NCI recommends that women in their 40s and older get screening mammograms every one to two years. Women who are at higher than average risk of breast cancer should talk with their health care providers about whether to have mammograms before age 40 and how often to have them. Women also can take an active part in the early detection of breast cancer by having regular clinical breast exams (breast exams performed by health professionals). Advances in screening have provided new tools for detection. In September of 2005, preliminary results from a large clinical trial of digital vs. film mammography found no difference in detecting breast cancer for the general populations of women in the trial. However, the Digital Mammographic Imaging Screening Trial (DMIST) found that women with dense breasts, who are pre- or perimenopausal (women who had a last menstrual period within 12 months of their mammograms), or who are younger than age 50, may benefit from having a digital rather than a regular film mammogram. More information about DMIST can be found at http://www.cancer.gov/newscenter/pressreleases/DMISTQandA. Please describe your experience with breast cancer. After using the tool, what is your breast cancer risk? Will it change your lifestyle or frequency of health exams? Have you been involved in any breast cancer prevention studies? If so, please share your experience. What types of screenings, mammograms, or ultrasounds do you get to prevent breast cancer?